In Cape Town we are privileged because of the beautiful scenery and wonderful walking routes so close to us. 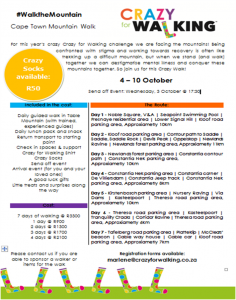 Therefore the Cape Town walk this year is dedicated to: “Walking the Mountain”. Living with mental illness is often like having to walking a mountain. Some days are filled with struggles and uphills, unexpected detours and tough terrains. The walk take place from the 3rd to the 10th of October. 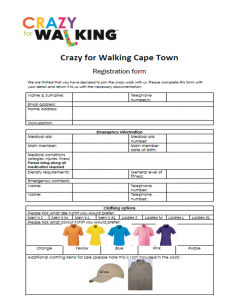 Starting at Noble Square, Waterfront, where we ended in 2017 and walking around Table Mountain to finally end at the Table Mountain Aerial Cable Way House on the 10th to celebrate World Mental Health day (Crazy Socks Day). A walk that will certainly raise eyebrows, attention and most importantly a very necessary awareness of the need to talk about mental illness and look after our own mental wellbeing!